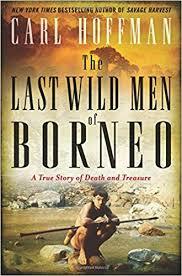 The Last Wild Men of Borneo by Carl Hoffman was a good book about travel, adventure, and two people whose lives were wildly different than most. Hoffman recounts tales from the lives of Swiss vagabond Bruno Manser, who spent years living with members of the Penan tribe in the jungles of Borneo, and American Michael Palmieri, who relocated to Bali and became a prolific trader in Indonesian art and antiquities, with many of the pieces acquired by him during long stretches of time spent in Borneo. It's noted in the book that the two men only met once, but their stories definitely shared the common thread of swashbuckling men craving original experiences and connecting greatly with the culture of the region and it's people. Manser first went into the rain forest in Borneo in 1984 at the age of 30, leaving behind his life as a shepherd in the Alps to go make contact with the isolated Penan tribe that he had read about. When he went in, there were around 7,000 Penan, with many of them nomadic and peaceful hunter-gatherers who lived in groups of 20-40, and Manser was fascinated by how they lived in harmony with nature. While he was with the Penan, their lands became more and more encroached upon by logging, and Manser tried to publicize their plight and help maintain their way of life, with this effort becoming a huge part of his identity. The other story told was that of American Michael Palmieri, someone who left his country to avoid the Vietnam War and lived a globe-trotting, wheeling and dealing life until finding a home in Bali in the 1970s. From this home base, he purchased sculptures and other artwork he sold into private collections or museums worldwide, with the art symbolic of a way of life, a connection with the wild and untouched as well as mystical and spiritual. The book is an interesting read that tells the story of both these two men and of the region and it's people through Manser and Palmieri and concludes with Hoffman writing of spending time with one of the rapidly diminishing number of Penan families living freely in the jungle and off the land with their loved ones.